After her arrest, Parks became an icon of the Civil Rights Movement but suffered hardships as a result. She lost her job at the department store, and her husband quit his job after his boss forbade him from talking about his wife or the legal case. Parks traveled and spoke extensively. In 1957, Raymond and Rosa Parks left Montgomery for Hampton, Virginia; mostly because she was unable to find work, but also because of disagreements with King and other leaders of Montgomery's struggling civil rights movement. In Hampton, she found a job as a hostess in an inn at black Hampton Institute. 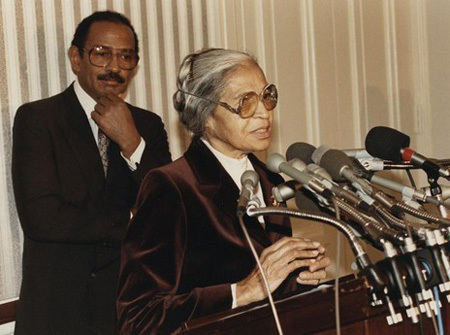 Later that year, after the urging of her brother and sister-in-law, Sylvester & Daisy McCauley, Rosa Parks, her husband Raymond, and her mother Leona McCauley, moved to Detroit, Michigan. Parks worked as a seamstress until 1965 when African-American U.S. Representative John Conyers hired her as a secretary and receptionist for his congressional office in Detroit. She held this position until she retired in 1988. In a telephone interview with CNN on October 24, 2005, Conyers recalled, "You treated her with deference because she was so quiet, so serene — just a very special person ... There was only one Rosa Parks". Later in life, Parks also served as a member of the Board of Advocates of the Planned Parenthood Federation of America. Yet the icon was also a warm and generous human being. Thus, when Rosa Parks died, Conyers explained, "America lost a living legend; and I, along with countless others, lost a friend." 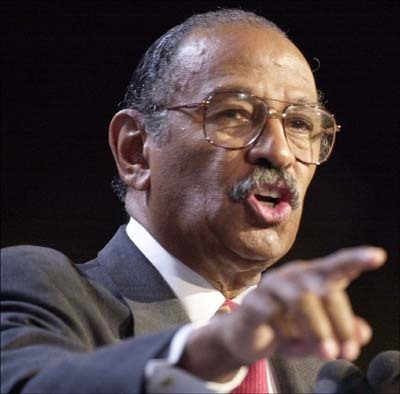 As a token of his respect for his former aide's accomplishments, Conyers always referred to her as "Mrs. Parks." But there was nothing formal about their friendship. She regarded him as the most important political leader in the many struggles that she waged--not just for civil rights but for peace, economic justice and, in particular, an end to the death penalty. We all knew that Mrs. Parks was frail. We always feared this moment, and now it is here. The extent to which she will be missed cannot be dignified with words. She and her husband moved to Detroit in 1957, and I think it is fair to say we bonded right away. Mrs. Parks was there with me at the beginning of my career as a Congressman in 1965 and worked for me as my administrative assistant for next 20 years until her retirment in 1988. I am therefore one of the lucky few who have had the privilege of being able to call her my colleague, as well as my friend. There will only ever be one Rosa Parks..."